Built on reputation, recommendation and over 10 years of experience, we provide a full professional service from free planning and design through to complete bathroom & kitchen installations. No matter what size your bathroom/kitchen or your budget we can create the room of your dreams that are unique. We will advise and together with you, design your bathroom or kitchen free of charge. Above all, you can be assured of a friendly and professional service. We are committed to offering products which are professionally installed by reliable, skilled craftsmen, bringing reassurance and confidence to our customers. Give us a call today, or fill out our online enquiry form, for your free no-obligation quotation. Established in 2004, we are a family run business based in Sidmouth. We offer a full range of building services, specialising in bathroom and kitchen design and installation. From the first designs to the completed project, not only do we install the chosen products but can also undertake any structural works, electrics, plastering, plumbing, tiling and carpentry. We serve most areas within a 30 mile radius of Sidmouth and offer a free initial quotation and design. 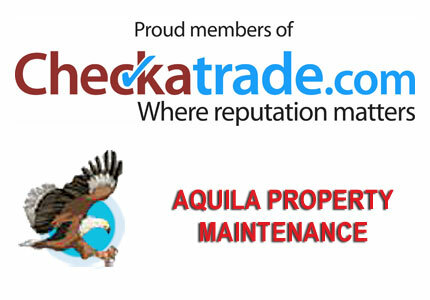 We have established Aquila Property Maintenance based on the values that are important to us as a family. We have very high standards and a keen eye for detail. The work will be carried out as quickly and cleanly as possible, and to the same standard as if we were working in our own home, to produce an outstanding finished product. We are always completely honest with customers and strive to offer value for money, always providing the best product that a customer’s budget allows. We are always completely honest with customers and strive to offer value for money, always providing the best product that a customer’s budget allows.